Marco Casolanetti’s Oasi degli Angeli estate in Marche has earned a cult following. 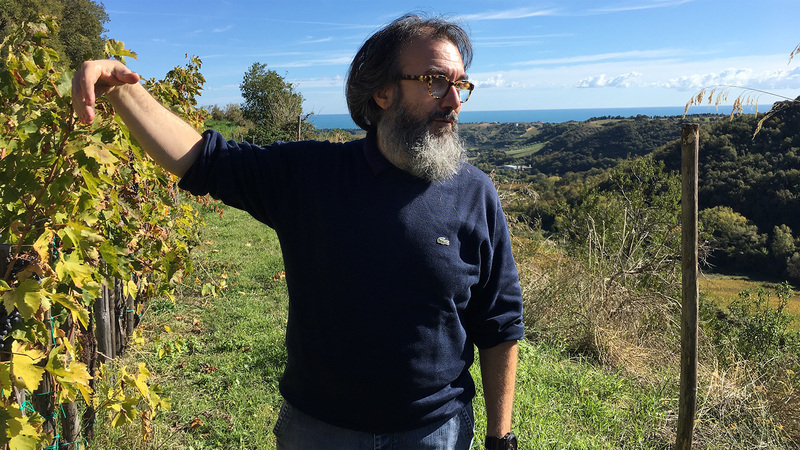 Marco Casolanetti’s beard has grown long and gray, giving him the look of a yogi as he stands in a high vineyard of central Italy’s stunningly verdant Sant’ Egidio valley, a blue strip of the Adriatic Sea visible in the distance. “It is a beautiful situation here,” Casolanetti says. Indeed, his life in the Marche region with his partner, Eleanor Rossi, looks like Eden. Their estate, Oasi degli Angeli, comprises 160 acres on which they cultivate wheat, fruit, livestock and olives, along with vineyards from which they make minute quantities of wine with a cult following. Oasi is best known for Kurni, a dark, rich and chewy Montepulciano red that has been compared to Amarone for its dense, high-alcohol style. With its dried and candied fruit notes, the wine can verge on sweet, but is balanced by bright acidity and fine tannins. As of its 20th anniversary, Kurni hasn’t changed, despite the movement throughout Italy to lighter, more delicate wines. In his past life in his twenties, Casolanetti was a design engineer who worked for Ducati motorcycles and Lamborghini in Bologna, where he lived with Rossi, then an actress and teacher. Before becoming winemakers, Casolanetti and Rossi tasted some of her family’s old bottlings of wine for personal consumption. Some were more than 40 years old and still alive. “Can we make this kind of wine?” they wondered. Casolanetti began talking with old contadini and learned the peasants’ pre-war methods of cultivation and vinification, which today he mixes with both modern and unconventional approaches. Kurni is produced from 36 acres of vines in sandy soils on south-facing slopes. Casolanetti, Rossi, her parents and a small team farm organically and spray the vines with natural fungicides and insect repellents such as garlic and orange essential oil. Oasi’s head-trained (“alberello”) vines are so drastically pruned in winter that green harvests during the growing season are never necessary—the vines produce only a tiny fraction of the maximum yields legally permitted in the appellation. For newer plots, to keep yields low, Casolanetti planted at an almost unheard-of density—up to 16,000 plants an acre—leaving just about 20 inches between vines. With production at just 16 cases an acre, how does Oasi thrive? Well, for one thing, Kurni isn’t cheap. U.S. retail prices start at about $100. Oasi also makes even tinier amounts of a lighter, leaner wine called Kupra, which has been likened to Burgundy and Barolo. With annual production of 42 cases, the price—if you can find it anywhere—is upwards of $200 per bottle. Kupra is sourced from about 3 acres of century-old vines locally called Lu Bordo, which genetic testing found to be Grenache, also known as Cannonau on the Italian island of Sardinia. Further research revealed that Sardinian shepherds who had emigrated north probably planted the vineyard. Since Kupra’s first vintage in 1999, Casolanetti has shared vine cuttings from the vineyard with about a half-dozen younger winemakers so they could plant their own vineyards with the grape. In the underground cellar he excavated nearly 20 years ago, Casolanetti ferments most of his wines with wild yeasts in small steel tanks without temperature controls. The grapes from his oldest vineyard of Montepulciano are fermented in conical wood tanks. His entire production of Kupra ferments in one egg-shaped concrete tank. To age his wines, especially Montepulciano, which has a tendency to show reduced aromas, Casolanetti came up with a solution that would bring oxygen to the wines, but wouldn’t require him to add sulfites, except for a small amount at bottling. The solution—anathema to some of his natural-wine brethren—was to age the wines in new French barriques and change out the small oak barrels, selected from a range of French coopers, after a year for an entirely new set. Kurni ages at least 21 months in barrel and Kupra for 30 months. Using 200 percent new oak allows Casolanetti to avoid adding sulfites at racking, as he doesn’t have to disinfect previously used barrels and also provides better oxygen exposure. “In older barrels, the wood has no more porosity,” he explains. Surprisingly, the wines don’t show a lot of oak flavors. “If the barrel is good, you don’t have the problem of tasting the wood in the wine,” Casolanetti says. That afternoon, he opens a bottle of 1999 Kurni that tastes remarkably young and fresh. “It’s really simple work we do here,” says Casolanetti. I don’t know about that. But he and Rossi do make it look easy.